Fancy new technology updates happen all the time – occasionally they can improve our every day lives. and this is one of these times.. If you wear spherical monthly disposable contact lenses this is for you! Air Optix contact lenses by Alcon have realeased Air Optix plus Hydraglyde. 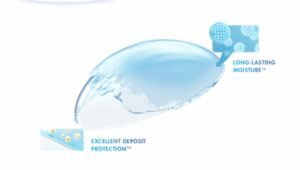 Hydraglyde is a smart-shield technology which provides a protective layer of moisture to the contact lens to help prevent deposits, giving consistent comfort all month long, as well as giving you a lens that keeps its moisture for continual hydration through the day. So if you feel like your lenses aren’t performing as well as you would like, or if you simply want the best lens available, call our customer care team to make the switch. The good news for our valued Central Vision patients is that we will upgrade you FOR FREE. A seamless transition for current Air Optix wearers with a current prescription, or a short refit appointment with free trial lenses for those wanting to change from a different lens.